When you start it, Change Owner automatically loads the current registered owner and organization. To modify them just type the new values and press the Change button. Just like CSRF v1.0, Change Owner v1.0 is distributed using a Creative Commons Attribution-Noncommercial 3.0 License. This tool is offered "as is" with no warranties. 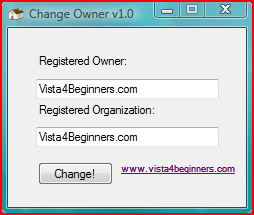 Change Owner v1.0 was designed and tested on Windows Vista and on our systems it worked with no problems. Also, it should work on systems with Windows XP and .NET Framework 2.0 installed. If you discover any bugs please feel free to report them to us. my computer shop set up my new Vista with my "real" name as user UGH! We are glad this small tool was useful for you! Thanks a million! I to had the same problem as jb5quid and also spent hours on this. Even going thru the registry! Will it change C:\user\blahblah on reboot? I have been trying to change this too. Also trying to map it to another hard drive? I moved all the folders but C:\user\blahblah keeps making new ones? Unfortunately it won't change the C:\users\username folder. That will remain the way it was. All you can do is to move the My Documents, My Music, My Pictures and Downloads folders to other locations. Thanks a lot guys! this tool works great and i love its simplicity (just hit the button!) tyvm! How can you get it to change from "owner" to the name you want in Task Manager?? I've changed it using the regedit option and this download. It still says "owner" under processes. all the executable files are blocked, Vista is a real bad thing. with it, not a directory not a file, nothing. You got it wrong. This program does not help you take ownership of your files. It just changes the registered owner and organization for your Windows Vista installation. i tried but this program didn't work. the window "attempted to perform an unauthorized operation" keeps popping up. i'm using an adminstrative account. I have exactly the same problem but with Windows 7 Home Edition. Is there also a tool like the one for Vista that may be easily applied?